On Dec 18, 1967, Vancouver police dog Valiant was shot as he pounced on a prison escapee hiding under a bed. Despite his injury, he stood guard until the suspect was taken to the police car. The bullet had punctured his lung, liver, kidney and intestine. Valiant was the first K9 from Vancouver to be killed in the line of duty. Stories like these have inspired dog lovers around the world ever since the City of Ghent, Belgium, first used police dogs in 1899. Five of those dogs made their way to launch the New York Police Department’s first K9 unit in 1908. The NYPD now boasts five K9 units with a total of 100 dogs. The Vancouver Police Canine Unit is the oldest municipal unit in Canada and has been fully operational since 1957. It deploys 15 teams in three units: emergency response, public safety and marine. Outfitted with custom ballistic vests, they are trained to track people and items, apprehend criminals, recover evidence, and detect narcotics, firearms and explosives. Their primary purpose is attending crimes in progress, or immediately afterward, such as break-and-enters and purse snatchings. As the Calgary Police Service points out, “a dog’s sense of smell is incredibly more refined than that of a human,” making K9s the ideal tool for locating suspects who have fled the scene of a crime and items related to the crime. The VPD selects social, high-drive dogs between 7 weeks and 2 years old from specialty breeders in Canada, the US, and Europe. They are X-rayed to confirm “excellent” hips, back, elbows and knees. After their first birthday, K9 recruits start a 14-to-17-week dog handler course. The Toronto Police Service’s 19-team unit uses German shepherds and Belgian Malinois as general purpose dogs and a Labrador, a springer spaniel and Malinois breeds for detecting narcotics, firearms and explosives. The NYPD’s elite transit K9 unit opts for Labradors to put commuters at ease. These special police dogs, selected from its bomb unit, undergo an additional year of training beyond basic bomb detection to sniff out suicide bombers and people carrying explosives. In all police departments, K9 recruits typically live with their handler and the team goes through training together. How are handlers selected and trained? Competition among officers to join the K9 unit is fierce. A recent NYPD K9 training session drew 180 applicants. Only 18 officers passed the vetting process. In Edmonton, constables with at least five years’ experience start out as quarries—or pretend bad guys—while off duty. They then take a puppy imprinter course and if accepted, the most senior quarries may raise an 8-week-old puppy at home, again on their own time. By the time the dog is 18-to-24-months old, the team undergoes extensive training together in tracking, criminal apprehension, searching, obedience and agility. Working 24/7, displaying courage, loyalty and intelligence, police dogs certainly earn their retirement, often after 7 or 8 years of service. At Radius, we have tremendous respect for the canine units who respond to our alarms. 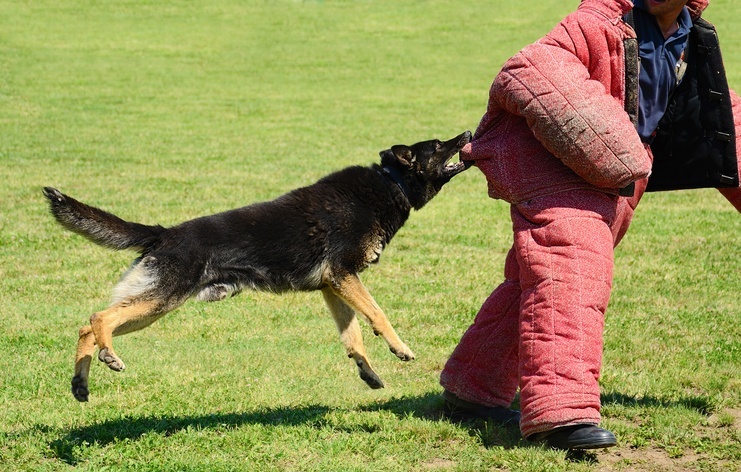 Have you seen these Redhanded video clips of K9s in action? More Redhanded videos of criminals Caught in the Act. Ferarra, Sue. The History of the First K-9 Unit Police Dogs. Classroom. Philipp, Joshua. The Elite K-9 Unit That Keeps New York Safe. The Epoch Times.